Six score and four years ago, one of the modern world’s oldest, most famous, and most enduringly popular brands was first registered as a trademark in the United States. On January 31, 1893, The Coca Cola Company of Atlanta, Georgia was granted U.S. Registration No. 22406 for the mark COCA-COLA in stylized lettering (specifically, per the registration certificate, “with the lower portion of the ‘C’ beginning the word ‘Coca’ extended under the entire word, in the form of a dash, and the top of the ‘C’ beginning the word ‘Cola’ extended over the letters following in the form of a dash”). 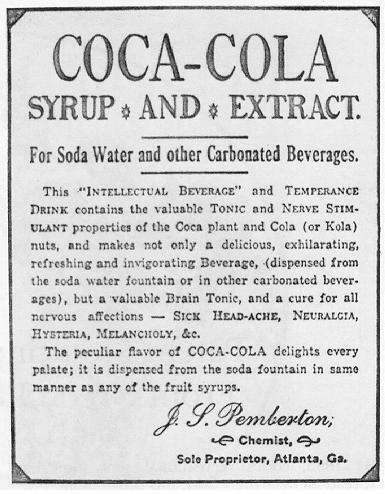 Originally marketed as a brain tonic and nerve stimulant, the mark was accordingly registered for “nutrient or tonic beverages.” The company has since dropped “nutrient beverages” from the list of registered goods, but the original COCA-COLA registration is still in force, and both the beverage’s usefulness as a “tonic” and the world’s insatiable appetite for overpriced sugar water apparently live on to this day.